How I Gained It: I have always struggled with weight, body image and, well, me! I loved acrobatics and gymnastics when I was younger and was always doing flips and cartwheels in our front yard. I was six when I fractured my wrist, right on the growth plate. Not knowing that, I continued to be very active, and in fourth grade, I had to have my first surgery — that was the beginning of six surgeries. I tried to stay involved in sports, but my lack of self-confidence kept me from playing. I just didn’t think I was cool enough. I kept getting bigger and felt more and more like an outcast. My school did a height and weight check in ninth grade, and I was 175 pounds. A so-called friend of mine found out and ridiculed me — I remember being called “orca” and a “cow” on the school bus. Needless to say, high school couldn’t have ended fast enough. By the eleventh grade, I was a size 20. In my senior year, I did manage to lose some weight through Slim Fast and just not eating, and I started I started college in the fall as a size 14. Then I met my husband and started to gain some weight back. My weight yo-yoed as I wasted a lot of money on weight loss programs and supplements. I felt gorgeous in my wedding dress — sure it was a size 18, but I felt like a princess. After I got married, it all changed — my weight continued to increase, and then I had my first baby. I was about 265 after the baby. I got pregnant again and after I had Cody, I was the heaviest I had ever been. Breaking Point: When my oldest son turned five, he got a trampoline for his birthday. He was so excited. “Mommy, can you jump on it with me?” he asked. I looked at the weight restrictions and realized that if I jumped on it with him and my youngest son, I would be exceeding the safety weight limit. I was devastated. I didn’t want to disappoint my sons and it made me realize all the things that I would probably miss out on because of my weight. 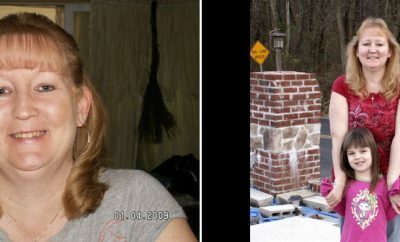 How I Lost It: I met my friend Jen in December 2005 and she was thinking of joining Weight Watchers for the first time. I said I would go with her. So in January 2006, we joined Weight Watchers together and I never turned back. I stepped on that scale weighing the most I ever had, 271 pounds. I still can’t believe I let myself go like that. I had done Weight Watchers before, but something just clicked this time, and the weight came off. I think this time around I was emotionally, mentally and physically focused to do this. I lost an average of two pounds a week. I followed the program to a tee, and the thought of jumping on the trampoline with my boys kept me going. Once I had lost 60 pounds, I started the Couch to 5K program. My goal was to run theBrentwood5K one summer — I did it 2007 and have run it every year since then. I learned to eat right and fit moderate exercise in, and my kids helped keep me going. My oldest boy would ask, “Mommy, if you eat that cookie, will you still be able to jump on the trampoline?” Needless to say, I put the cookie down. In March 2007, I hit my goal weight of 167 pounds, and I became a lifetime member on my birthday, May 3, 2007. My sister asked me when I was going to start eating normally again. My reply? “This is my normal.” The following year, I went away to train to be a leader for Weight Watchers. Then, on May 3, 2009 I ran my first half marathon. So much has happened to me personally during this weight loss transformation, and for the first time ever, I can say I feel gorgeous. I love me and who I am, and I am finally physically the person I was inside. People would tell me that I have a great personality and a beautiful soul, but now I feel beautiful inside and out. I shine with self-confidence. Becky has maintained her weight loss for over three years, and spends lots of time on the trampoline with her boys. Today, she’s celebrating her three-year anniversary as a Weight Watchers Lifetime member, as well as her birthday. ← Previous Story Real Weight Loss Success Stories: Jazmin Dropped 75 Pounds And Went From Sad And Weak To Strong And Happy! Can you please describe what you ate for a day? Amazing, Becky! Kids are always our biggest motivation. Good for you! My Atkins Weight Loss Journey & Taking Back Control Of My Life !! !